The last few days have been very strange. Tuesday while I was out promoting World Tribune my parents and brother had a big argument. It ended with my Mom and brother splitting. Wednesday we did not hear from them and found that Ron had not gone to school. We were a bit worried and I stayed home from the meeting to do a little studying. I studied but also went out with my Dad to find out what was up. We discovered nothing. Thursday, my dad heard from my mom and arranged to talk with her Friday at four. During the evening Ken, Nancy, Jason, Rich, and I promoted World Tribune. I got on unexpectedly from Mike Rosenberg. It was the first time I had ever met him. After I came home I went over to Nancy’s and gave her my term paper to type. Thursday night—my aunt got arrested for drunk driving, it seems everything has exploded. Friday, I was again really wasted, went to school and completely blew my Man’s Religion Test. Later I turned in my History paper and shakubukued my History Professor. After school I split home and awhile I was hitchhiking I reshakubuked an old titan member. He, I think was encouraged. As I was walking further my mom and brother picked me up. They seemed very tense, but Ron was excited about moving to Mammoth. They were very questioning and seemed perplexed by my calm attitude. So they came home and packed and we then all ate dinner together. I went to Nancy’s and she gave me a ride to the Toso. My brother split and I felt like crying, but did not. Nancy and I promoted but did not accomplish much. We then went to the Honbu and I chanted for a while and talked to Shibucho for a few minutes. We then split for the Valley. We talked about many things including our relationship and she dropped me off. She forget to pick up her Human Revolution and so came into my room. Well the probable happened. We played with the clarinet and then kissed. Walked outside of the front door and we got involved. Afterwards, I think we realized something and really got something out of it. We knew we really dug what we did, but realized that unless we cut it we would end up like other members that have that type of relationship. Either one goes titan, or both, or their practice stagnates. So we agreed that we must help each other and develop our true relationship, we must completely cut our old relationship. We agreed that it would be hard not to do it, but if we help each other we could accomplish it…I guess one calls it, Standing Alone. We both resolved that such an experience could be changed into elixir and could be for our growth. After she left I chanted for a half hour to really change the relationship. We agreed not to become guilt ridden or tense about our relation, but to develop an even more beautiful and constructive relationship. (Saturday) The meeting with Soshibucho tonight was very spirited. I freaked out, but still gave an experience. It is hard sometimes, you know. My Dad showed up late and after the meeting I introduced him to Gary Curtis. My Dad has really freaked out. I really see he needs the Gohonzon. Well, Nancy brought me home and we talked and discussed our problems. It was revealing. I guess Gohonzon has really given me an opportunity to grow. 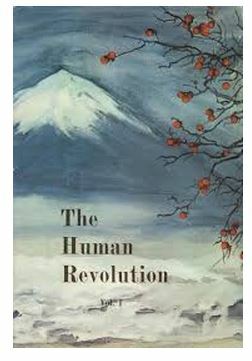 Human Revolution: The story of Daisaku Ikeda under the pseudonym of Shin’ichi Yamamoto which chronicles his days as a follower of Nichiren Daishonin’s Buddhism, e.g., Kansai campaign, time with Josei Toda.